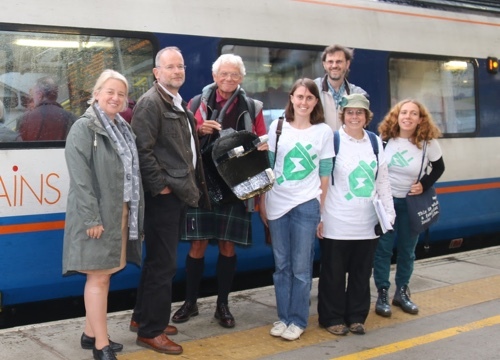 Last Saturday (September 9), environmental campaigners boarded a train in London, carrying a giant electrical plug. They then passed it on at Bedford and the plug continued in a relay all the way to Sheffield. Local groups all the way along the route called on the Government to reverse the decision made in July to cancel plans to electrify the Midland Mainline beyond Kettering. They asked the Government to ‘plug in’ their trains to reduce air pollution and carbon emissions. On the day, both on the trains and at stations, campaigners collected signatures on a petition asking the Government not to go back on their promise to electrify the railways. The petition was created by two national organisations, 10:10 and the Campaign for Better Transport. After the green plug arrived at Sheffield station there was a rally calling for electrification organised by the Sheffield Climate Alliance, Sheffield Friends of the Earth and Sheffield Green Party. “Electrifying the railways would reduce the carbon footprint of travel because electricity generation is rapidly becoming cleaner. Diesel trains also contribute to air pollution, which is estimated to cause 40,000 premature deaths a year in the UK. Switching to electric trains would lead to substantial improvements in air quality in Sheffield, where it contributed to 500 deaths last year. The following groups were involved in the relay: Bedford Green Party, East Midlands Rail Campaign, Northampton Friends of the Earth, Sustainable Harborough, Leicester Friends of the Earth, Transition Town Chesterfield, Sheffield Climate Alliance and Sheffield Green Party.